Offering an unusual setting for your renders, here is a wood framed house attic for use in Poser and DAZ Studio. 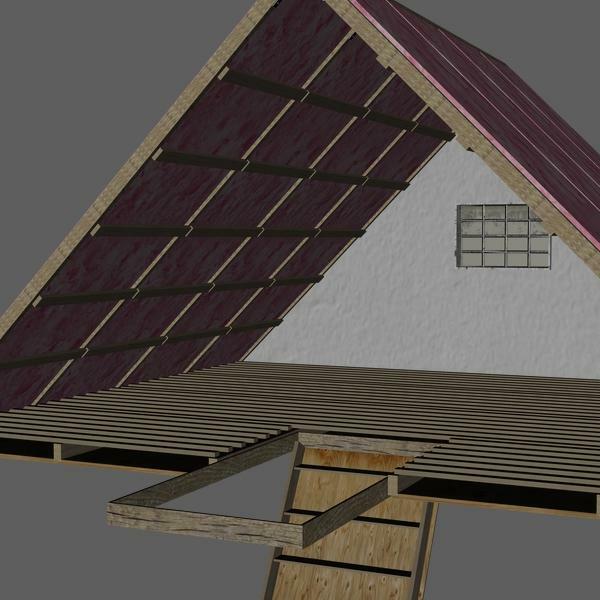 The attic environment prop is comprised of one "half" of a typical residential wood framed attic. It features a window, pink insulation, wood framed rafters, floor stringers and also includes a folding access ladder, with the ability to extend or retract each segment of the ladder. In DAZ Studio, you can extend or retract the ladder by adjusting the "Extend Ladder Upper" and "Extend Ladder Lower" settings on each of the sub-objects. This feature should also be possible in Poser, but I have no ability to confirm this. The texture files included are of fairly high resolution, to allow for close up views and detailed render settings. In addition, a set of Promo renderings have been provided to show the different parts of the collection. These renderings were done in DAZ Studio 4.5 with basic lighting and no shadows. PC users and Poser users should (hopefully) have no difficulties with the .pp2 Poser file or the texture JPEG files, as far as I know, however they have not been tested on those platforms or software. The textures used in this set have been created using a combination of texture and material sample imagery from CG Textures and some applied Photoshop™ work by myself. NOTE: Images from CG Textures may not be redistributed by default. Please visit www.cgtextures.com for more information. quietrob (3 years ago) Inappropriate? Again I thank you! Rated! rikkittee (5 years ago) Inappropriate? mbhdesign (5 years ago) Inappropriate? Hi everyone! I have just revised the .pp2 file in this offering to (hopefully) work correctly for those using Poser 6 and up on a PC platform. The .pp2 file now references "smartparent" as opposed to "parent" for each of the .OBJ files. Hope that solves any issues. If anyone else has any difficulties with these files, please comment here to let me know. I'm always more …Hi everyone! I have just revised the .pp2 file in this offering to (hopefully) work correctly for those using Poser 6 and up on a PC platform. The .pp2 file now references "smartparent" as opposed to "parent" for each of the .OBJ files. Hope that solves any issues. If anyone else has any difficulties with these files, please comment here to let me know. I'm always happy to help troubleshoot and find a solution with you. Thanks everyone for your comments and feedback! George: I'm sorry this isn't working for you as it should. I will try to troubleshoot the issue and see if I can revise the .pp2 file to work properly for you. George (5 years ago) Inappropriate? Nice looking prop. However, after installing the .pp2 in Poser on a PC, all that appeares in Props and shows on the paramiter dials is the ladder, and it doesn't work. Redmysticangel (5 years ago) Inappropriate? NewTet (5 years ago) Inappropriate? NanetteTredoux (5 years ago) Inappropriate?